Today I started my family tree and went back to Dirk Thijsz. Plecker who married Marietje Pieters in 1706. I could never have done this without the help of the already existent family tree by Greet Plekker-van Sante. Finding relatives is not an addiction though very close. So I created an account with Geni and went along. There is still so many info to add to this tree which I will copy form Greet. I also need your help with facts and dates. Please contact me by e-mail (see link at the bottom of this post). In the coming weeks I will update the tree at least 2 -3 times per week and will post the update on this blog. Please subscribe to keep informed. I am very much looking forward to your help! This morning I found e-mails from Robert Plekker in my mail box, attached foto’s of John, William and Johannes Plekker including their children. I will put the pictures up as soon as possible. 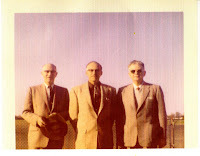 The father of the three Plekker bothers shown here was John Plekker Sr. whose picture is already on the site. And half an hour ago Jane Douros, grand daughter of John Plekker, commented to the first blog post. She loves to get in touch with the relatives of her grandfather. I am delighted and hope to hear from many more relatives, no matter in which degree. After all we all share the same anchestors! Over the past few weeks I have been browsing the Internet for names and e-mail addresses connected to Plekkers in every way. I think I found appr. 90 names and addresses and sent as many mails. Nothing indicates that these addresses are still valid but like we say in Holland “Nooit geschoten is altijd mis” or “If you don’t shoot, you will always miss”. From Greet I received the message that a Jackie Plekker visited my blog due to my e-mail message and she contacted Astrid Plekker. The e-mail served it's purpose because my goal with this blog is to organize a (virtual) reunion, sharing pictures and memories. To my delight the Orlebeke family has been replying. As well as the Dutch as the USA tribe. Ko Orlebeke in the Netherlands, nephew to Joe, phoned me via Skype and we had a nice chat. He sent me pictures and promised more send by other addresses. This morning I received a very nice and warm reply from Timothy Orlebeke from the US. He confirmed being the son of Clifton Orlebeke and mentioned he forwarded my e-mail to his father who will get in touch with me. It is with Clifton’s permission that Timothy replied to me. I visited my mother this morning and told her that her Orlebeke cousins are still alive and that I have Clifton’s e-mail address. My mother is suffering from severe heart failure and feels fortunate that she is still here to hear about her cousins. Her smile was worth a million e-mails. She still remembers her uncle Joe and Aunt Mien from their visit to Holland in 1964, not long before my grand mother Klasina passed away due to Cancer. I met them too but can’t remember them anymore unfortunately. Mum says there has to be a picture of me sitting in between Joe and Mien. Yet another good reason to browse every available picture book in the family. You will understand that the Albums are far from complete…. Joe Orlebeke, Mien Orlebeke-Plekker and children. Rev. Henry Radius, Corrie Radius-Plekker and children. Instead of one Plekker Album, I gave the Plekkers who married into other families, their own album. Everyone with the surname Plekker is sharing one album but maybe (hopefully) I have to divide those in South Africa, Holland, USA and Australia. A big thank you to Brian Plekker who sent me family photo’s form South Africa. May others follow! Yesterday I browsed White pages for Plekkers and phoned Mrs. Randall Plekker, Grand Rapids US. She was pleasantly surprised and knew so many names of Plekkers, also of those who married into other families. We talked for a while which was great and because her husband wasn’t at home, she gave me the phone number of her brother in law Robert Plekker. I phoned Robert who told me he received my e-mail of a few days before (I wasn’t sure if it was the same Robert) and said he visited the blog where he read about my brown eyes. He told me that he will forward my e-mail to his aunt Elaine Plekker who is in her 80’s and busy working out her family tree. So searching is definitely in the air! Elaine has many pictures which would be great for the album. I am very much looking forward getting in touch with Elaine. My mother remembers well that when the war ended in 1945 with the whole family short of descent clothing, Elaine and Lawrene’s parents – William and Mathilde Plekker – sent dresses, coats, shoes etc. to my grandparents for Nel, Mies and Wil. Very thankful and proud they were wearing the most beautiful clothes of excellent fabrics and fashion like never seen in Zaandam before. This morning I told my mother about Elaine and Mum’s eyes were sparkling. Wouldn’t it be great if they could speak on the phone? It will certainly bring up stories which I will post here. Stay tuned! "The bond that links your true family is not one of blood, but of respect and joy in each other's life. Rarely do members of one family grow up under the same roof." A quote of Richard Bach in his novel "Illusions-the adventures of a reluctant Messiah"(he is also the author of Jonathan Livingstone seagull). How true this is. There are relatives who feel like strangers and friends who feel like family members. Though it is intriguing to meet “strangers” who are relatives in the 5th – 6th degree but who share the same “habit” genes. This is what we noticed during the visit of Greet and Luuk. My mother and I can be very down to earth, we don’t get upset easily, often see the funny side of things. Don’t misunderstand me, we can be profound but we very seldom spend energy on unnecessary things. This is also the fact with some of my cousins, children of Nel Best-Hartog (<- Spits <- Plekker). The way we reply to questions is also one of those habits. And it was interesting to see this confirmed by Luuk. This intrigues me. You can see where some habits come from when you live close to your relatives but meeting one you never saw before but recognizing certain behaviours is just great. It also made me realize it is a pity I never knew my great grandparents. I still remember my grandmother Klazina Hartog-Spits (<- Plekker) well and know I look and act like her. My grandmother who I loved to bits, looked like her mother Wilhelmina Spits-Plekker so obviously great grandmother and I would have got along well. I love to listen to stories about her told by my mother who was 21 when her grandmother passed away. Grandmother Wilhelmina loved having her grand children around her and taught them knitting. They all had their own knitting projects in a big rattan basket which is still in use by me. The grand children loved their grandma and gathered in her house as soon as they were off school on the Wednesday afternoon. We are lucky to have a few family films from 1941 with my great grandparents walking or busy in their house. Great grandmother Wilhelmina was not an average person. Where others were quite static on the film, she walked with firm steps, her coat waving, hat slightly oblique on her head, one arm hooked in great grandfather’s arm, waving an smiling at the filmmaker. Being a great grand daughter of Wilhelmina Sibbelina Plekker (1875 – 1949) and Teunis Spits (1868 – 1943) Zaandam and occasionally recognized by my brown “Plekker eyes” I felt a strong need to browse first Skype and secondly the Internet for Plekkers. I found a website with a very informative family tree of Greet Plekker-van Sante. I sent her an e-mail and received one in return that very same day, full of enthusiasm about meeting a descendant of a Plekker. More e-mails followed and only 4 days later, March 3 2007, my mother Wilhelmina Hartog, daughter of Klazina Spits (daughter of Wilhelmina Sibbelina Plekker) and Dirk Hartog, and I met Greet and Luuk. They travelled to Friesland with a bag full of documents. We had a great day with lots and lots of stories, pictures and data. Greet gave me the copy of the family tree dating back to 1550. We just couldn’t stop talking and Greet was noting all the missing details we could provide via our own small archive. No doubt Greet knows what to do during her leisure time in the near future! Greet and Luuk showed us a beautiful picture album of their trip to South Africa where they met many (though not all) other Plekkers. To one, Janos, I talked on Skype and it would be wonderful to talk to others at well. The Plekkers married into other families like Spits, Offenberg, Beudeker, Hermanides, De Jong, Orlebeke, Radius, De Jong and Rosier. And probably a few more. Many moved to South Africa and the United States. But there are also Plekkers living in Australia. To those we have and haven’t located, feel free to contact Greet or me and please tell your story in this blog. The Plekkers were millers for many generations. 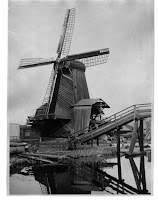 Their “Paltrok” Mill was called “De Pet” , built in 1725 and which stood at the “Westzijderveld” Zaandam behind the NS railway station. It is taken down in the 20th Century (please fill in the date) after it wasn’t in use anymore for 7 years. The Plekkers bought the mill in 1868 and the last owner was Willem Plekker. A picture of the magnificent “De Pet” is the first one on this blog. For other pictures of our ancestors, uncles, aunts, cousins, please visit the Album. The album is going to be extended with many more pictures in the very near future. Feel free to download them and please donate your own Plekker pictures. Bare in mind that the people in this album either passed away a long time ago gave their permission to publish the pictures. Respect them and don’t use the pictures for commercial purposes. (Freelance)Writer, U&APS author, translator, proof reader, blogger. Short stories inspired by photo's of abandoned properties and portraits. Please contact me for more info. I will be proud when you quote my stories but please contact me on forehand. Do not repost or use the photo's without asking the permission of the photographer! All stories and photo's are licensed.